This particular broken down tree has already appeared in this post but I also really like the way it looks from this angle. It’s amazing sometimes the way two different angles of exactly the same thing can look so contrasting. It’s been a while since I have been able to pay any attention to my blog, six weeks to be exact, due to a small fracture in my collarbone. Along with not being able to type very well one other concession I had to make was giving up photography for the same period. I must say it’s kind of strange not being able to use my camera for such a long time. I don’t think I have ever gone this long without even taking the odd snap shot. Since I became obsessed with photography twenty years ago I very rarely go anywhere without a camera, there are times when I can’t even go to the supermarket without bringing at least a little compact camera in my pocket, you just never know what you might see on the way. I am so obsessed with having a camera at all times that I have now noticed my [almost] three year old son now goes to the park and make clicking noises whilst holding his hands up to his eyes, he regularly tells me to stand still and then uses his imaginary camera to take a snapshot of me. I have also noticed, much to my delight I should add, that he also makes sure to wind on the film after every shot, now there’s a traditional photographer in the making. Anyway, it’s great to be back again and I hope to have some lovely new shots in the next week or two. Firstly I have to find out where the young fella has hidden all my cameras though. 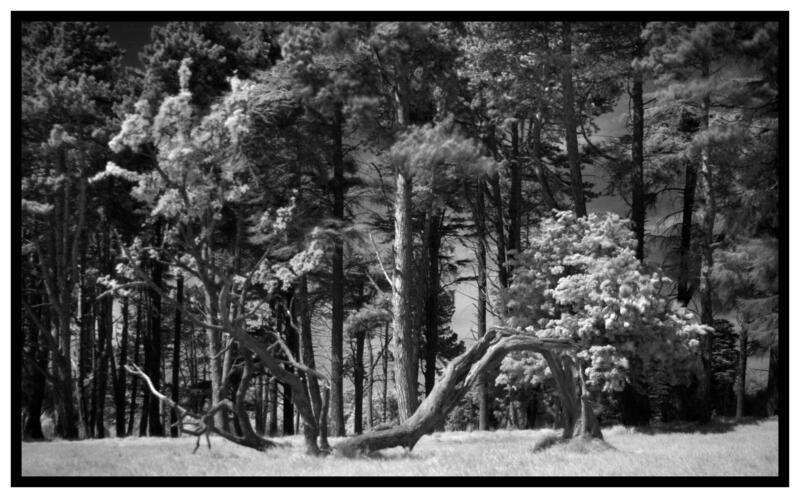 This entry was posted in Black and White Photography, Infra-red Photography, Irish Landscapes, Phoenix Park and tagged Black and White, Dream Like, Infra-red Photography, Phoenix Park, Trees. Bookmark the permalink. Thanks so much Emad, really enjoyed browsing through your blog too. Keep shooting and enjoy it as much as you can. Thanks Charlie, it’s nice to able to type again, wish I could get back to taking photos again though. Hopefully in another week or two, fingers crossed. Thanks so much Andy, very much appreciated. I see we both share a deep deep love of all things monochrome.